Tell me that is not the cutest (gluten free!) cupcake you have ever seen?! You may be thinking "Why is she writing about a Valentine's Day treat in September?" Well, while this is obviously a perfect Valentine's Day treat, you can't tell me that your kids (or husband!) 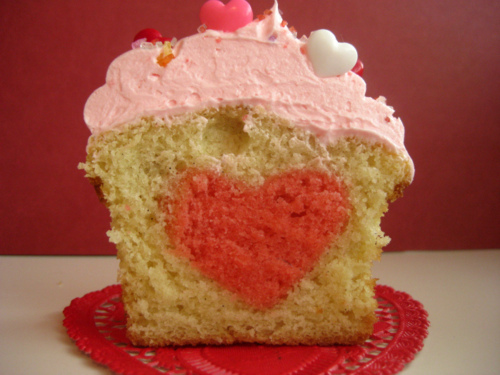 wouldn't love to bit into a cupcake and find a warm, loving heart staring back at them! Even better? It's pretty darn easy! Gluten free, grain free, dairy free, nut free - and deliciously adorable. Here's the tutorial from Made With Love for how to create this amazingly adorable confection! Gluten Free Strawberry Cupcakes - maybe add a little food coloring (natural or otherwise) and use this batter for the hearts?! Yes you can bake this without Red Dye #40 - you can use any variety of food coloring, including natural choices (like beet or raspberry juice) to achieve the red color. As for the how-to, the link above to the tutorial from Made With Love shows you how! Thanks for reading! That is the original link.